Jan Moscovic, a member of Turtles on Snow, smacks the ball over net to Marissa Cereceres of Dollz with Ballz during Saturday’s inaugural snow volleyball tournament near Howelsen Hill. 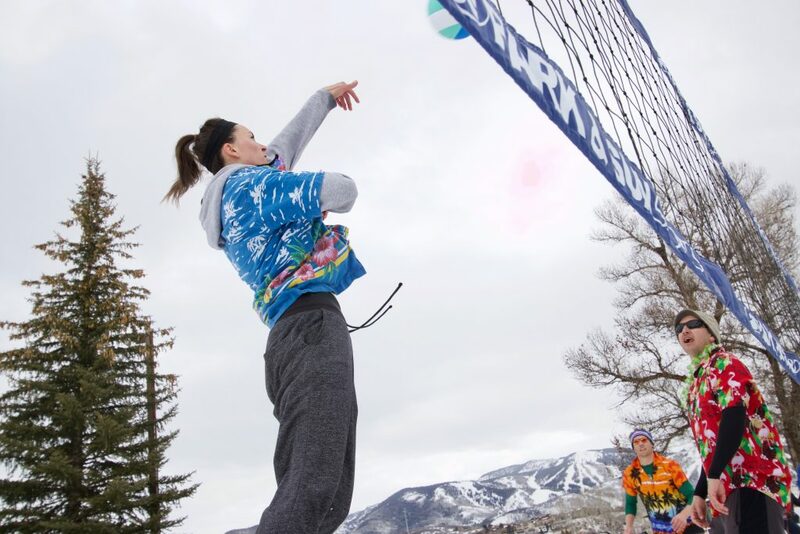 Zuzana Jakubova launches a serve to her opponents during Saturday’s snow volleyball competition near Howelsen Hill. 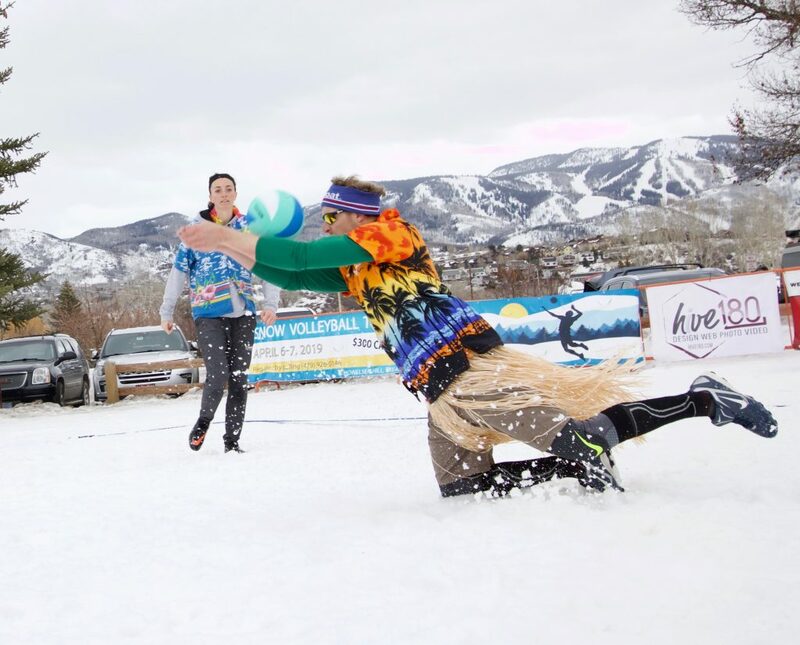 At Least Two Swingers duke it out against the Net Ninjas during Saturday’s snow volleyball tournament near Howelsen Hill. Spectators watch as teams competed for a $300 cash prize during Saturday’s snow volleyball tournament near Howelsen Hill. Colleen King lunges to keep the ball from hitting the ground during Saturday’s snow volleyball tournament near Howelsen Hill. Chris Fletcher takes to his knees to prevent the ball from hitting the ground during Saturday’s snow volleyball tournament near Howelsen Hill. Colleen King jumps to send the ball over the net during a match against her opponents, Turtles on Snow. 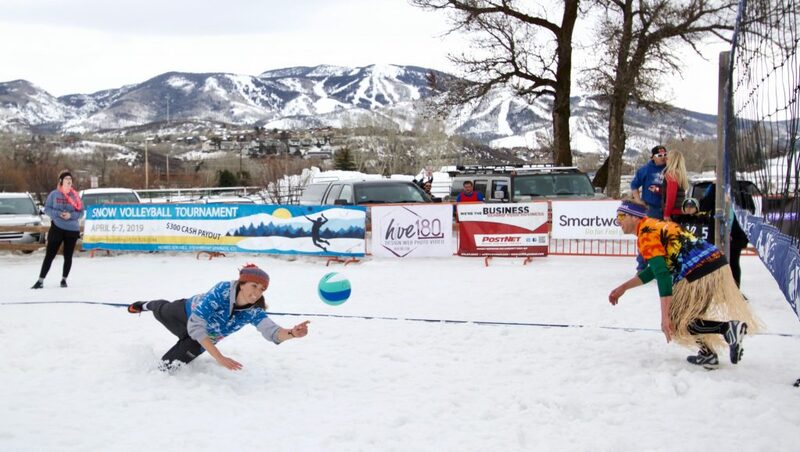 The teams competed for a $300 cash prize during Saturday’s snow volleyball tournament near Howelsen Hill. 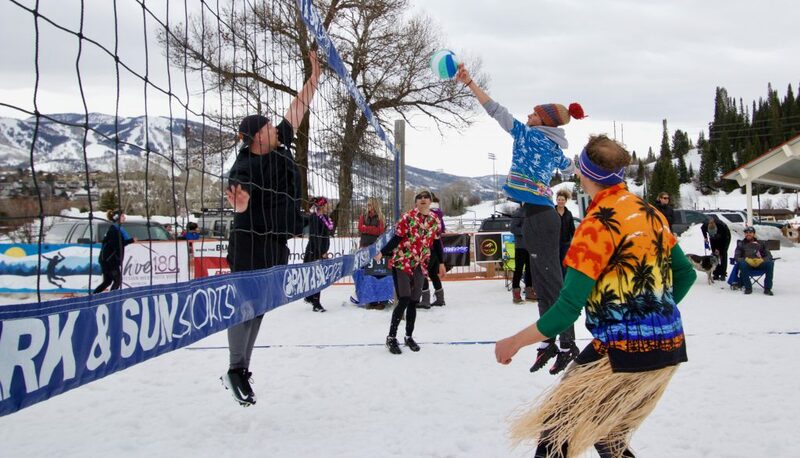 STEAMBOAT SPRINGS — The sand courts were still covered in winter white on Saturday, but that didn’t stop nine teams from competing in Steamboat Springs’ first winter volleyball tournament near Howelsen Hill. Competitors swung, spiked and sometimes outright slipped their way through volleys, each hoping to take home the $300 cash prize. Slovakian native Lucia Howard organized the two-day tournament, which operated under the moniker Snow Volley USA. The teams of three convened before the day’s matches to go over the rules. Most sipped coffee from Starbucks cups in an effort keep warm. By 9 a.m., one woman had already cracked open an India pale ale. For the most part, the sport is played just like beach volleyball with a few exceptions. The net was slightly lower due to the layer of snow, and the ball is specifically designed for winter conditions. “It’s basically a beach volleyball, but it’s waterproof,” Howard explained. 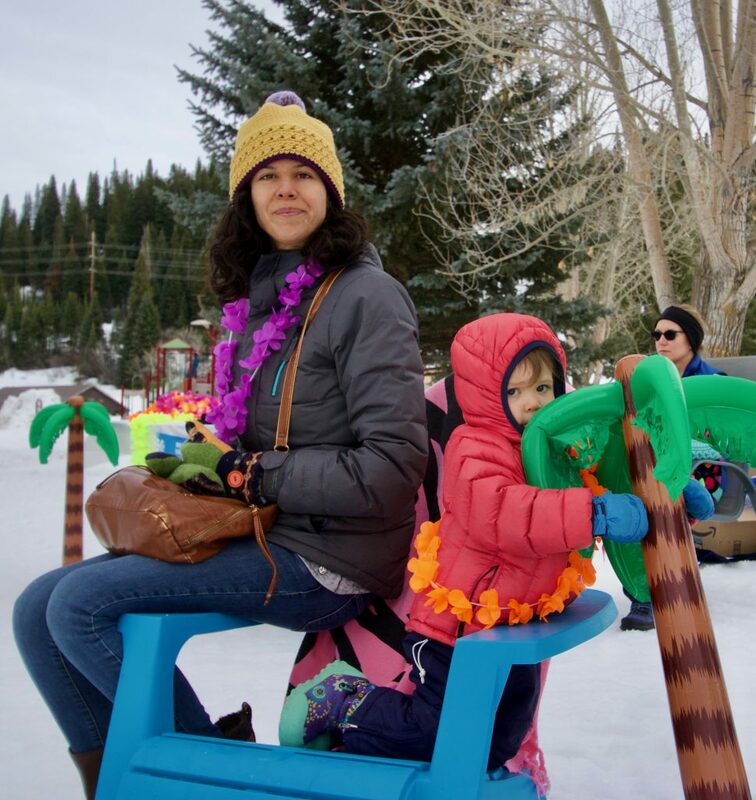 She was able to bring a couple back from tournaments she helped to organize in Europe, where snow volleyball is more popular. 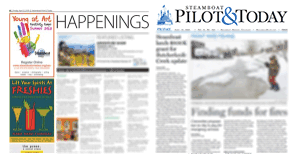 Teams traveled from across the state to be a part of Steamboat sports history. Zuzana Jakubova, a friend of Howard’s and a fellow Slovakian native, drove from her home in Denver for the tournament. She and her team, Turtles on Snow, had never played volleyball outside of summer. They practiced a couple times prior to Saturday, but were mostly just there to have fun. Some of them congregated behind their SUV as they discussed the day’s matches. “It’s a secret, but we do have a strategy,” Jakubova said. That strategy seemed to include a lot of falling on the snow, but the team managed to win their first match against Dollz with Ballz, composed of a trio of women from Winter Park. Tony Almanzan, a fellow member of Turtles on Snow, took most of the dives for his team. While his teammates were clad in cleats, he chose a pair of Nike sneakers. “I’m sliding everywhere,” he shouted after taking a digger in a patch of slush. 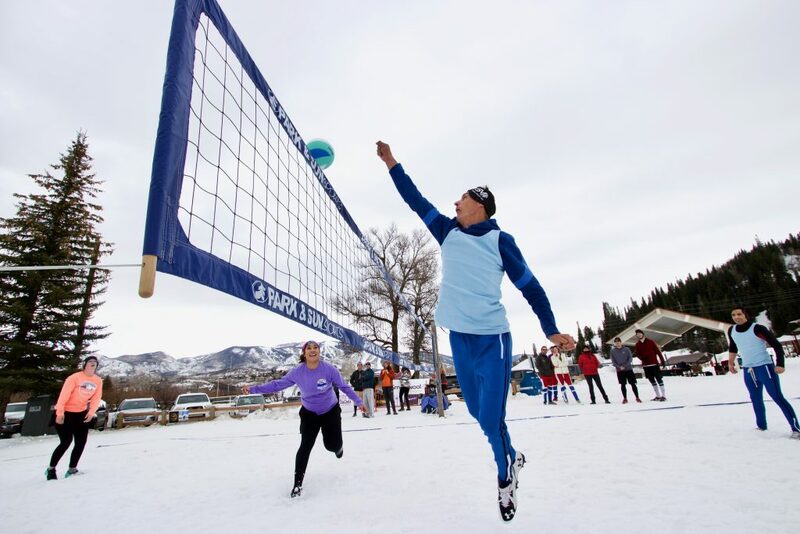 Almanzan has played volleyball on sand, but taking the sport to the snow added a unique degree of challenge. The first match taught him to move slower and more carefully next time. “If you try to react too quickly, you just slip and fall,” he said. Steamboat locals also came out to compete. Steve Fletcher, an avid beach volleyball player, was one of, as his team name suggests, At Least Two Swingers. 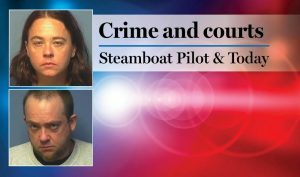 He was joined by Colleen King and Beau Bell, all of whom donned Hawaiian shirts for uniforms. Fletcher said the snow on Saturday was much more packed down and easier to maneuver than last week, when the team tried to practice. 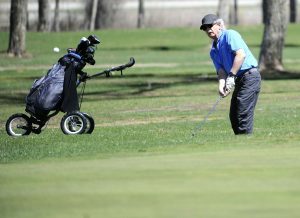 “We were post-holing to get out here,” he said. Perhaps there are some kinks to work out, but that is the case with any new development. 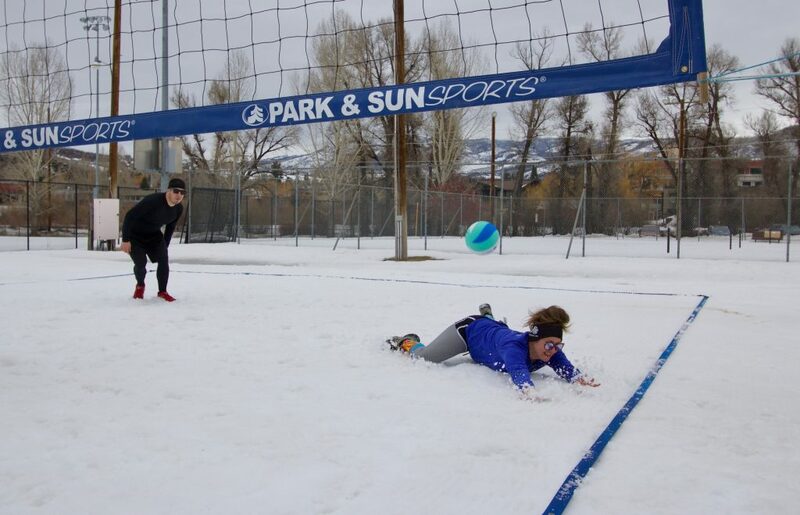 Snow volleyball has only been around for about a decade, according to Howard. An Austrian man named Martin Kaswurm reportedly started the sport at a ski resort in his home country. He and his family set up a court in 2008 and hosted a small, amateur tournament much like Howard’s a year later. Since then, the sport has gained more serious competitors and international recognition. 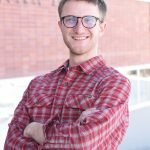 “In the last two years, it’s become more commercialized,” Howard said. 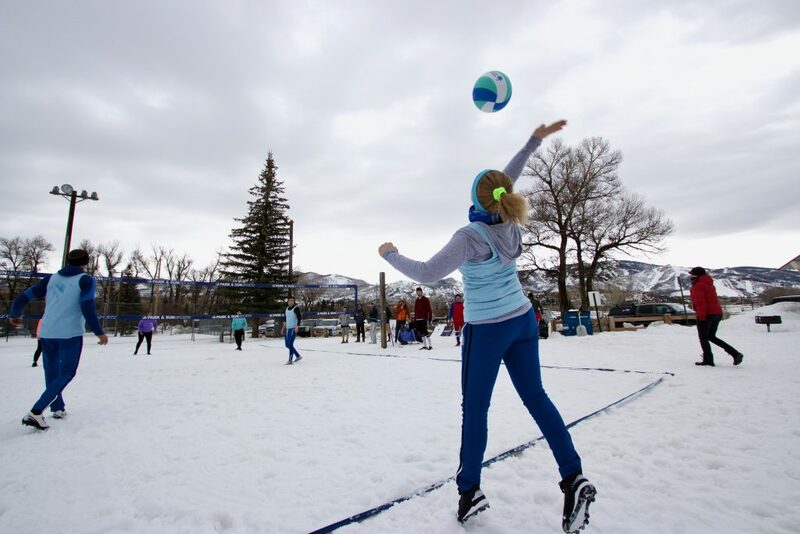 The International Federation of Volleyball now recognizes snow volleyball as a sport and helped facilitate the first Snow Volleyball World Tour event last week in Austria. As the sport becomes more popular, the federation hopes to establish a world championship by 2020, with the ultimate goal of bringing it to the Winter Olympics. Howard shares that ambition and hopes to grow the local tournament next year, as well as the years to come. 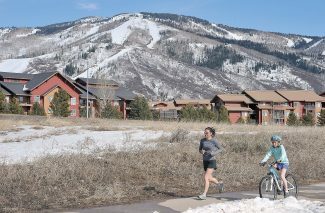 She eventually wants to bring it to Steamboat Resort, which would offer more panoramic views and better snow conditions. “We’ll make sure we’ll have many more tournaments,” Howard said. The matches are scheduled to continue on Sunday, snow or shine.